Praise the Lord! 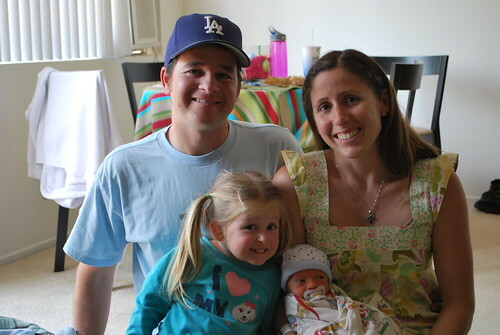 We brought home our son Brody, through adoption, on April 10th, 2010. We may have our baby but we're definitely still on our journey, and so excited about what God has in store for us. To view the archives related to adoption, you can click here. My journal about our adoption experience is here. To read about our journey and decision for adoption, start here. Ours is an open domestic adoption with Bethany Christian Services. We get together with Brody's birthparents every few months and enjoy spending time with them. I also connect with his birthmother via texting & social media, too. Part of our adoption story is that we've been through four miscarriages and and have one two biological daughters. We are so thankful that God brought us through this journey so that He could grow our family through adoption. When Brody was 8 weeks old, I wrote a post for The Art of Simple about the lessons I'd learned, in that short time, on adoption and parenting in general. You can read that here. *updated 12/10* Our adoption is now finalized! We are still paying off the fees but other than that, Brody is officially and legally part of our forever family now. *updated 7/11* We finally received our adoption tax credit refund from the IRS, which we used to pay back my parents, who had loaned us the rest of our fee money. Brody's adoption is officially paid for-- praise the Lord! Adoption isn't the only way to care for orphans like God calls us to in His word. Here is a great resource with more ideas!